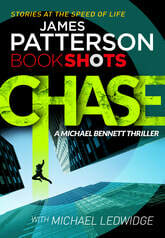 Chase is a fast-paced novella released under James Patterson's pocket-friendly "Book Shots." This is the first Michael Bennett story I have read. Here Michael is investigating the death of a man who has jumped off a tall tower, or so it appears. It looks like a suicide but until the forensics team digs out a mysterious piece of paper from the dead man's tummy. The starting chapter was pretty cool; two mysterious hit-men confronting a man, followed by a small cat and mouse game leading to the death of the latter.